We have discussed about Ex-works and FCA in detail in different articles in this web blog. What is the difference between FCA and Ex Works? 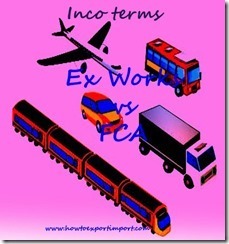 Let us compare FCA with ex works terms of delivery. In terms of delivery Ex-works, the seller delivers goods to the buyer at his (seller’s) premises. The buyer arranges transportation and all other costs to carry the goods to his premises have to be met by him. The obligation of delivery of goods by the seller is too limited to arrange goods at his factory premises only. Buyer arranges transportation to move goods from seller’s factory to his premises with his own cost. The seller arranges to load the goods to buyer’s nominated carrier to move goods from seller’s premises to buyer’s place at buyer’s cost. Insurance also is arranged by buyer under ex-works terms. However, in terms of FCA delivery, the export cleared goods are delivered by the seller to the carrier at the named and defined location mentioned in the contract. So the obligation to deliver goods fulfills by the seller up to the location where FCA contracts. From the said point of location, buyer needs to take responsibility. In an FCA terms of delivery, normally seller’s assistance is required by the buyer to deliver goods at contracted place at buyer’s costs and risks. If the location to deliver goods has not been mentioned in the contract, the seller can arrange to deliver the goods to the location where buyer’s carrier is available by mutually accepting. In an FCA terms of delivery, the delivery of goods also can be at the seller’s premises, if mutually agreed between buyer and seller. However in such transactions, the ex-works terms are used. FCA terms are commonly used on container transport movement as RO/RO (roll on – roll off) used by trailers and ferries. If the buyer can not carry out the export formalities, either directly or indirectly, FCA terms are opted in such business transactions also. I hope, I have clarified the difference between Ex-works and FCA terms of delivery in international trade. Harsh: On 26 October 2013 Yes, this is best example to understand these terms . Andrew S.: On 12 May 2015 Thank you for the post! Much more natural language than in most other explanations. One question regarding: In an FCA terms of delivery, the delivery of goods also can be at the seller’s premises, if mutually agreed between buyer and seller. However in such transactions, the ex-works terms are used. If the location is at the seller's premises, isn't there still a difference between FCA and EXW where FCA obliges the seller to provide clearance documents (while EXW doesn't?). So even if the goods are being offered at the seller's premises, if the seller will provide the export/clearance documents then the incoterm should be FCA? saleem: On 04 March 2017 Thank you for the post. Can you please guide me responsibility of forwarder fee in FCA term? Is the seller responsible to pay HBL/MBL and other local charges except THC to the buyer's nominated forwarder? Jann: On 29 November 2017 Ive got a Problem with this one : "The seller arranges to load the goods to buyer’s nominated carrier to move goods from seller’s premises to buyer’s place at buyer’s cost." The seller doesnt arrange to load the goods! This is very important. EXW means, that the seller has to provide the goods at his warehouse. Its not sellers Task to load the goods on buyers truck!!! Difference between DAP in payment terms and DAP in delivery terms.